Miami Marlins CEO Derek Jeter has done plenty to remake his new franchise in the image of his former team, the New York Yankees. He brought over Gary Denbo to be their VP of scouting and player development and even traded the reigning NL MVP to New York for prospects. Now he’s bringing a fellow member of the Core Four to bolster the front office. 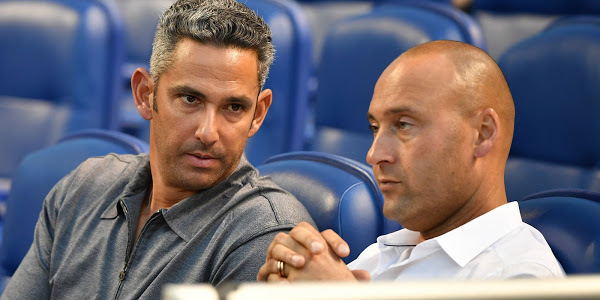 According to a report from SiriusXM’s Craig Mish, the Marlins are expected to bring in former Yankees catcher Jorge Posada as a special adviser to baseball operations. Posada, who spent 17 seasons in pinstripes, retired after the 2011 season and rejoined the Yankees in 2013 spring training as a guest instructor. That’s been a fairly common role for Yankees legends, including fellow Core Four member Andy Pettitte, who actually came out of retirement after briefly attending 2012 spring training as a guest instructor. Already a South Florida resident, Posada will relinquish his role with the Bronx Bombers now that he’ll be working for a new franchise, and he currently does not have plans to take the field as an instructor during the Marlins camp in Jupiter, Florida. Despite finishing with four World Series titles, five All-Star appearances and five Silver Slugger awards, Posada fell off the Hall of Fame ballot in 2017 after garnering just 3.8 percent of the vote in his first year of eligibility. His 275 career home runs is tied for the 15th-most of all time among catchers, while his .474 slugging percentage ranks 17th. All eyes now turn to the remaining members of the Core Four: Pettitte and the recently enshrined Mariano Rivera. Will either of them join the Marlins? JT Realmuto has already been traded to the Philadelphia Phillies, but maybe one of them can assist in a Drew Steckenrider deal if the Yankees need another reliever.